I have a question for all you lovely babes: how do you decide which blogs to read? Because real talk: doesn't it seem like there's a lot of content out there? And that a lot of it is the same, and, well, *whispers* not very good? I know it's something I certainly don't like to think about, because as a blogger/content creator/influencer/insertotherbuzzwordhere, I'm part of the problem as well. And this isn't just me being fake modest — I've run into forums in the past criticizing my blog, saying they don't understand my success and that it seems like I'm trying to emulate a specific kind of style and not really getting it, etc etc. Others commented that my photos were always blurry, causing me to seriously think that I was going blind for a good few weeks and use a tripod for a month before giving it up because I was just too damn lazy. So yes, I am well aware that my stuff is not everybody's jam. And it stings a little, but I don't take it personally because not everything is my jam either? Which brings me back to my original question: so how do you decide which blogs to read? How do you discover new ones? And why do you decide to stop reading the ones that you do? For a long time, I was super meticulous about reading a ton of blogs and social media accounts. I followed so many blogs on my "Food Blogs" feed on Feedly that I eventually had to break it up into two feeds because it kept freezing on me. I liked things, hearted them, pinned them, and left swooning comments. But fast forward to several years later: I'm burned out. With the exception of a few folks, nothing really stands out to me anymore. It's all a blur of white marble, Erickson Woodworks backdrops (like the one you see in these photos 😳😳😳), and disembodied hands lovingly caressing... erm, stuff. Usually the same Finex skillet, AHeirloom cakestand, or Dansk mini saucepan (or is it saucepot — what's the difference again?). It's all very nice and lovely, but also a little bland and boring. To be fair, I think I'm doing it wrong. I reached out to a few of my blogger friends and asked them these same questions. To my surprise, they admitted that they were very selective about whose blogs they read — and they seemed much happier for it. The trick, it seems, is to just follow on Instagram (though that has its own issues too, especially with the stupid algorithm) and just click over when something seems especially compelling. But that still doesn't really answer my question. Because in the end, what makes a blog compelling enough to stick with? How do you decide which blogs to read and keep reading? Teach me your ways, friends. And thanks for not losing faith in this little space of mine, especially when there's so much of the same type of stuff out there. Sumac is a citrusy, maroon flower that is frequently used as an aromatic in Middle Eastern cuisine. Usually found in savory dishes, it tastes a lot like lemon zest but funkier and more complex. I've been known to throw it in desserts before. In a pinch, you can use your favorite citrus zest, but I highly recommend sourcing it! You can find it in Middle Eastern groceries, specialty spice stores, or online. New Yorkers: I got mine from Kalustyan's in Manhattan, but I've also seen it in Sahadi's in Brooklyn and the Whole Foods in Williamsburg. 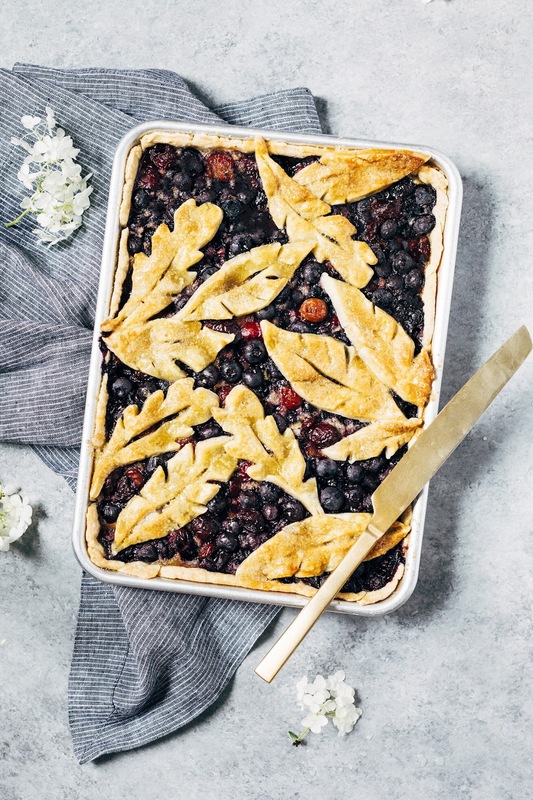 Let's talk about this pie! 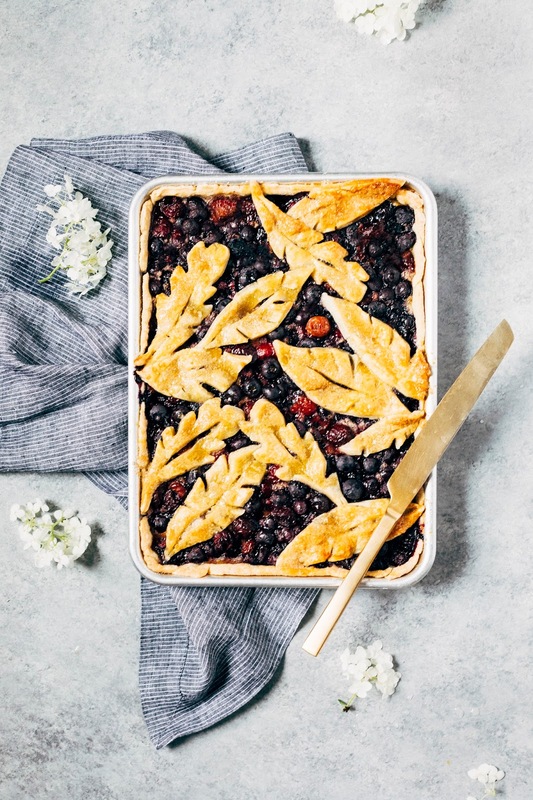 I love staring at all the elaborate braided and stamped pies (here's looking at you, Samantha and Jo — a.k.a The Pie Queens of Instagram) and have been prone to making them in the past myself. But sometimes (ehem most of the time TBH), I just don't have the time or patience for that. 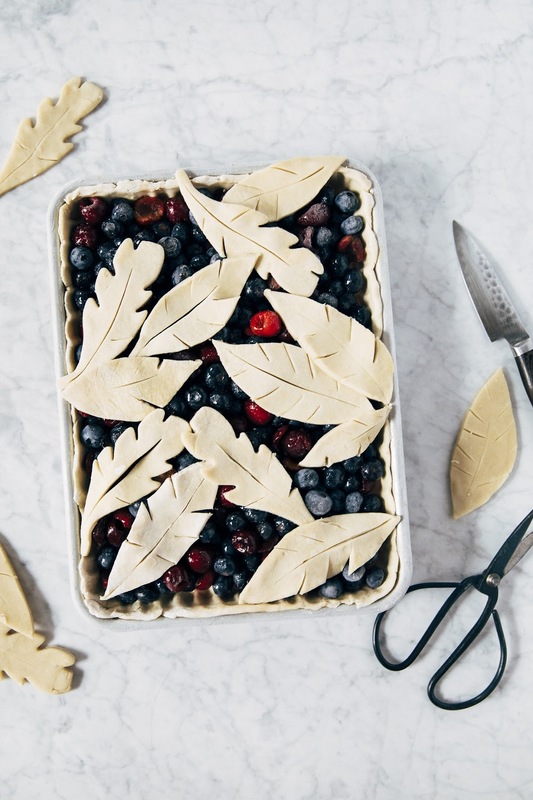 Enter the rustic leaf pie. You just need a sharp paring knife to draw out some rough leaf shapes and score them. They don't even have to be pretty. It's incredibly easy and forgiving, and they bake up beautifully. I used this visual step-by-step guide from White On Rice Couple to help me get started, but I also have my own picture-based guide on how to draw the leaf shapes coming to the Crate and Barrel Blog soon! In a large liquid measuring cup, combine 1/2 cup ice, 1/2 cup very cold water, and a dash of apple cider vinegar. Give it a good whisk with a small whisk or fork, and transfer to the refrigerator to keep chilled while you work with the dry ingredients. In a food processor, pulse together 2 1/2 cups flour, 1 tablespoon granulated sugar, and 1 teaspoon kosher salt several times to combine. Add 1 cup very cold unsalted butter cubes. Pulse until the mixture resembles coarse meal with pea-sized pieces remaining. Sprinkle with 4 tablespoons water from the ice water mixture in the 1st step. Pulse until dough is crumbly but holds together when squeezed with fingers; if necessary, add up to 2 tablespoons more water, 1 tablespoon at a time. Be careful not to overprocess or add too much liquid! Pulse until it just holds together. Turn out the dough onto a lightly floured work surface. Divide dough into two even halves. Form each half into a disk. Wrap tightly in plastic, and refrigerate until firm, at least 1 hour, preferably overnight. In a small bowl, combine 1/3 cup granulated sugar and 1 tablespoon sumac. Use your fingers to rub the sumac into the sugar, to help infuse the sumac flavor into the sugar. Transfer to a medium bowl. Add 2 cups fresh blueberries, 1 cup fresh cherries, 1/4 cup cornstarch, and a pinch of kosher salt. Toss to combine — the mixture will be slightly goopy, but that's what you want. First, make the base crust. 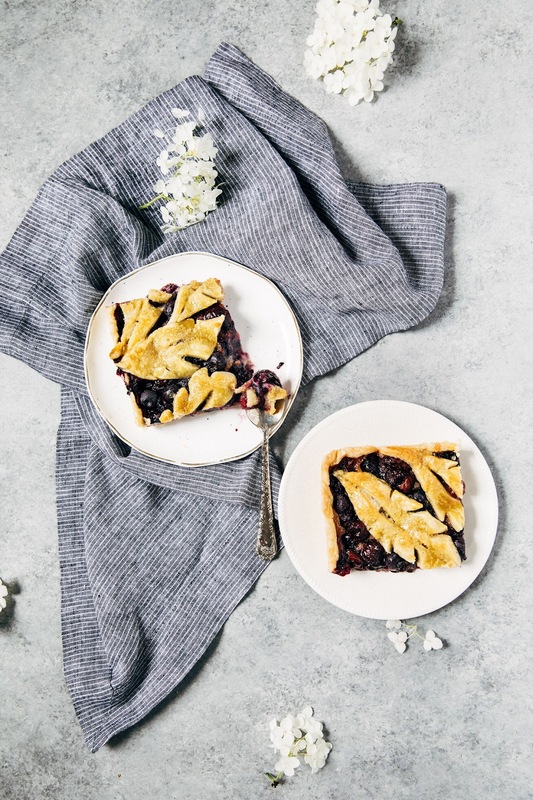 Remove one of the pie dough disks from the refrigerator and use a rolling pin to roll into a rectangle slightly larger than a quarter sheet pan — if you're using a 9 x 13-inch pan, aim for a 11 x 15-inch rectangle. Transfer to your sheet pan and use your fingers to press the crust firmly up against the sides of the pan, trimming any excess overhang. 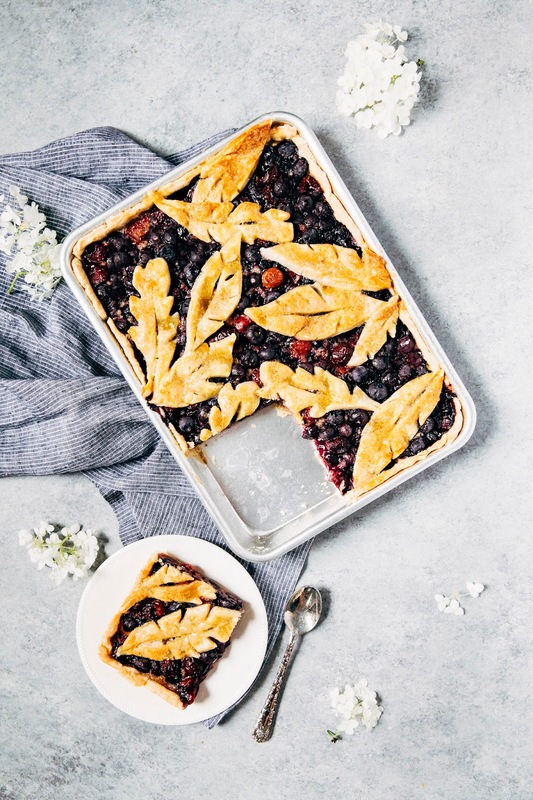 Next, use a rubber spatula to scoop the blueberry sumac filling evenly over the rolled out base crust and transfer to the refrigerator as you make the leaf crust topping. Remove the second pie dough disk and roll into a rough circle about 1/4-inch thick. Use a paring knife to carve out as many leaf shapes as you can, gathering and re-rolling any scraps as necessary. Use the paring knife to score the center and edges of the leaf shapes to create leaf texture. If the dough is getting too soft and hard to work with, transfer to the freezer to chill for 10 to 15 minutes. Lay the leaves in a random pattern across the pie filling, cover loosely with plastic wrap, and transfer to the freezer to chill for 1 hour, but preferably overnight for best results. When you’re ready to bake the pie, center a rack in the oven and preheat to 350 (F). Quickly make an egg wash by whisking together 1 large egg and 1 teaspoon of water in a small bowl; use a pastry brush to brush the egg wash over the leaves, and sprinkle immediately with demerara sugar. 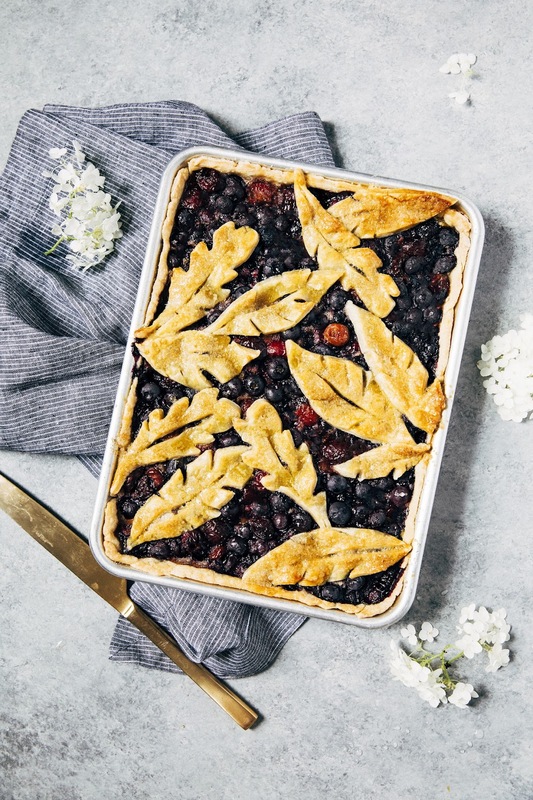 Transfer the quarter sheet pan to the center rack of the oven and bake for around 60 minutes, or until the crust is golden brown and the fruit juices bubble. Transfer to a wire rack and cool for about an hour or so, to allow the juices to set. Serve slightly warm, with a scoop of vanilla ice cream or fresh whipped cream. Enjoy!